I was contacted several days ago by a fellow freelance writer and blogger. He was having problems on his WordPress site where his theme was no longer compatible with the WordPress core. It caused elements of his site to disappear. Another colleague pointed him in my direction, and thankfully I was able to find a patch. The problem? The patch was for a different version of his theme. And the file that needed to be patched didn't seem to exist in his copy. Fortunately I had a simple solution. I knew the problem query in the theme. All I had to do was find out which file it was in for his version. To do that, I opened up Notepad++, a replacement for Notepad (the text editor you'll find pre-installed in Windows). 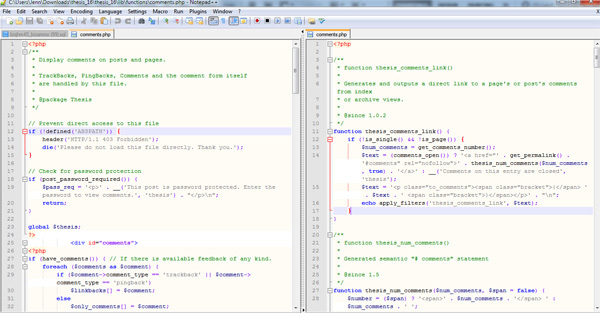 It's a great tool for developers because it features syntax highlighting while Notepad does not. But it has a couple of features that make it great for bloggers too, especially when dealing with theme problems or manual upgrades. Notepad++ has a fantastic search feature. You can search for something throughout an entire directory rather quickly and easily. In this case, I had access to the blogger's server so I could zip / compress his entire theme folder. I downloaded that to my hard drive and unzipped / decompressed it so I had a normal folder. Then all I had to do was use Notepad++ to search that folder for text from the database query causing problems. Once I knew where the query was located, I could open the correct file on his server and apply the patch. The entire process took somewhere between five and ten minutes after having found the patch. Easy peasy. The site was fixed, and everything was showing up again. This is probably my favorite feature of Notepad++ as a blogger. It makes it easy to find whatever I'm looking for in a theme or plugin file (which I often need for customization or problem-solving). While the search feature of Notepad++ is my favorite tool, it does have another feature that makes it useful for bloggers who like to manually work on theme and plugin files: its multi-document tab interface. It's kind of like your browser. You can have several windows or documents open at once, and there are tabs along the top so you can quickly hop around between them. 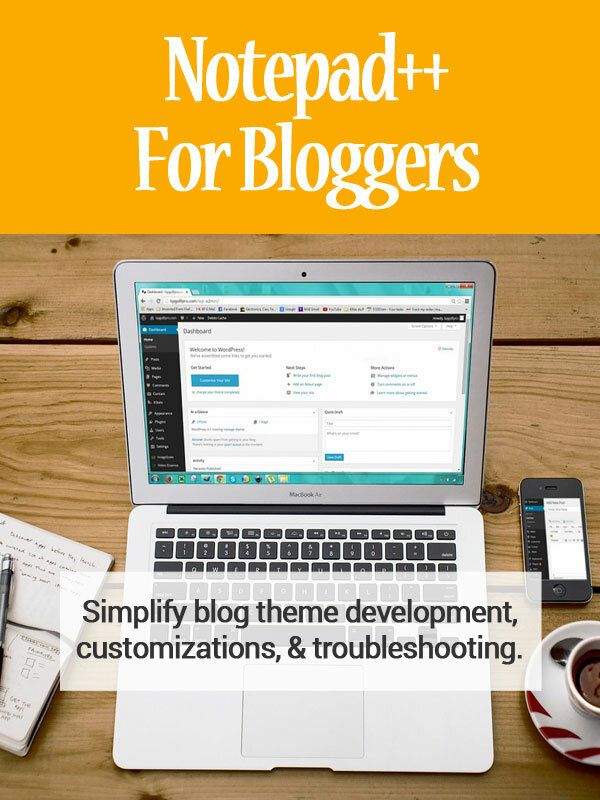 Why is this useful for bloggers? Well, if you ever customize your theme (or child theme), you should have a backup before making any changes. And if you make a mistake and break the theme, this tab interface makes it quite easy to compare the original to your changes. You can even compare the documents side by side. To view two documents at once side by side, just right-click the tab for one of them and click on "move to other view." Again, easy peasy. These two features might not sound like a big deal. But if you're a blogger who regularly works with theme or plugin files, they can save an extraordinary amount of time. And the best part? Notepad++ is free. So why not download a copy and take it for a spin? Keep in mind this is Windows software. I can't recommend anything specific for Mac users that might have similar features, but if you're aware of something please feel free to suggest it in the comments. This is really a very amazing tutorial, but i think you would have recorded a short video explaining all this. However, i found the post very good. I’m having an issue with my blog, i can’t use w3 total catch. I always show me an error sign whenever i activate it and even wp super catch. It seems there is a file missing on my wordpress directory.